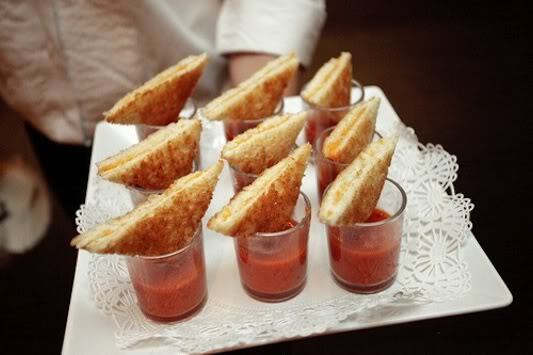 Serve with a shot glass of tomato soup! You know how I love my grilled cheese! Here’s our take on a recipe by Bobby Flay. It makes a great appetizer for a small group of people, and it is super easy to make ahead and then grill at the last minute. Cook bacon until just crisp, set aside. Spread coconut oil on 1 side of each slice of bread. Layer 4 of the slices of the bread with 3 to 4 slices of brie, 2 tomato slices, watercress, 2 slices goat cheese, and as much bacon as you like and season with salt and freshly ground black pepper. Place the remaining bread slices on top, coconut oil side up and cook on a griddle or Panini maker until golden brown on both sides and the brie has melted. 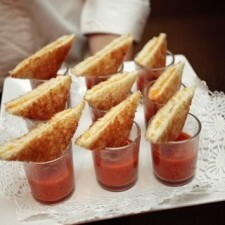 Slice sandwiches into quarters and serve alone or with little cups of hot tomato soup.